The best horse I’ve ever ridden. I arrived at the barn early tonight, and went into the arena where Christy was riding Liam. We started talking about our plan for my lesson, given the fact that I was a bit sore and stiff (but not back enough to keep me out of the saddle! Woo!) One thing led to another, and we started talking about my issues bending. I surmised that my difficulties stem from the fact that I’m still working on developing acuity with my new position. Okay. My new year’s resolution, which I’m starting early, is to say “Yes Ma’am” when Christy wants me to do something. I have to at least try. I put my trepidation and excuses away, and donned my helmet, put on my gloves, and took the reins on the horse that have admired for years, and who I love almost as much as I love Jag. Liam is Christy’s exclusive territory. Her boyfriend Mark sometimes hops on and walks around on him, and on a couple occasions, Christy’s had one of her students get on, but by and large, Liam is Christy’s ride 99.99% of the time. He’s ridden by a pro, and he is finely tuned and delicately honed. Together they’re schooling things like canter half passes and tempi changes. Liam is very sensitive, and very fit. He’s a super good boy, but he’s still a little intimidating, to me, at least. This experiment, she told me, would reveal whether or not I was giving bending aids correctly. She had me walk him in a circle, coaching me through the delicate, delicate aids to which Liam was trained to respond. She had me keep all my aids very quiet, and then once I had contact, she had me push gently with my inside seatbone. In a heartbeat, Liam bent gently around my leg. We walked on, and we maintained the bend with just the quietest contact and aids. “No, that’s too much, that was a leg yield,” Christy noted once. I swear that I had merely raised one of my eyebrows. “Now go for feather light contact,” she said, as we walked around holding the bend. I softened the contact, and Liam held it, staying attuned to these soft, quiet aids. We spiraled in and spiraled out, guided by just the slightest shifts in my weight. “Wow,” I said, repeatedly. This was a whole new ball game. Riding Liam gave me a whole new perspective, both for the responsiveness that can be trained, and also, the immense control Christy has over herself when she rides. Over the next few minutes, she had me change the bend, and then do some leg yields, shoulders in and, incredibly, haunches in and haunches out. And it was effortless. A slight push with a seatbone, brush with a calf, or shift in weight was all it took to guide Liam. through these movements. I can’t really describe how illuminating this little exercise was. I then tacked up Derbs, and warmed him up, and then Christy got on, and some important truths were revealed. Derbs wasn’t responsive – at all – to her seat. So she took the opportunity to install some buttons for me, and talk me through it. She first flexed him right and left, while standing, and he gave very nicely to the rein pressure. So that was a good start. Then she moved him off, walking, and tested his response to her seat, specifically, whether or not he moved over when she pushed a seatbone into the saddle and asked him to step over. She got nothing, so she quickly addressed Derby in terms he understood, backing up the seatbone aid with an opening rein and a spur, and then quickly graduating to an indirect rein, and the seatbone aid, and then just the seatbone. It was really interesting watching Derby respond and as she worked him, his walk got better and better. Then I got back on, and voila, I had a new button to push. I was able to re-create Christy’s work, and move Derbs around with my seat. The visual we use is “the canter pirouette seat” – which creates a mental image (for me, at least) of sitting straight and deep, and liiiiffting the inside seatbone while channeling the haunches with an outside leg. This little mental mnemonic device devised by Christy has been really helpful in helping me visualize and then execute the correct aids. Christy made the point to me (and it’s one she’s made before) that I shouldn’t have to work hard to get these basic movements. Derby has been training me. It’s time, she said, for me to think more about training him. So it’s cool that I passed my pop quiz on the schoolmaster with flying colors. But it’s daunting that I need to think as much about training Derbs as I do myself. One more twist on the dressage journey path, I guess! I was riding adorable little Tucker, who is very well trained and sensitive. Christy was mounted on her newly off the track baby horse Remy, who is just starting to really use his back and is getting the dressage basics down quickly. From the back of her green bean, as we discussed how aids need to be 1) distinct and 2) contextual, she gave me a short demo of how to move different horse parts around. Under her guidance, Remy did one step of shoulder in one way, and repated it on the other side. Then, again at he invitation, he moved his haunches a step in either direction. As Christy talked through the movements, she highlighted how she uses her aids to block and channel the horse’s movement. 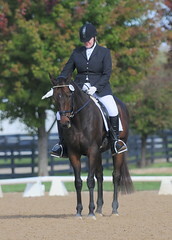 An outside rein can hold a shoulder, a foot slightly back blocks a haunch, while the aids on the opposite side invite, encourage and guide movement. I immediately thought of how water flows. It finds the path of least resistance. But water (like certain crafty Quarter Horses I know) is also good at evading the channels humans create for it. It will take advantage of weak points. Horses are the same. Indistinct or unconvincing aids open the door for evasions or incorrect movements. 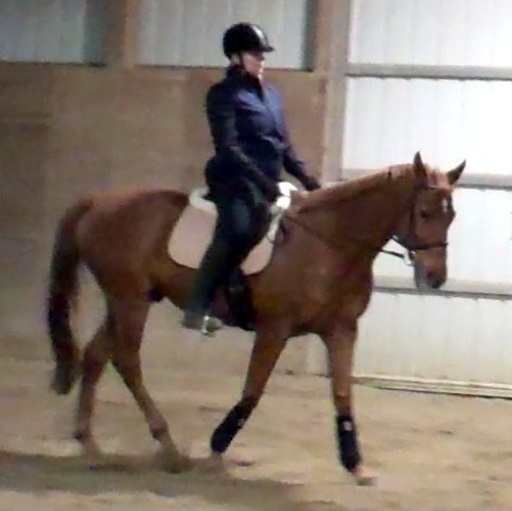 Under Christy’s careful riding, Remy the green bean performed a few strides of both haunches in and out. As Christy pointed out, you don’t train entire movements. Horses don’t have magical buttons one can push to generate the renvers, or a half-pass, or a piaffe. The movements are the sum total of the horse’s gaits + the rider’s aids. And, frankly, the rider’s aids have a much larger coefficient in the total equation. I started experimenting on Tucker. I’ve ridden a lot of shoulder in at both the walk and trot, and can also manage its corallary, shoulder-out. But deliberately controlling just one stride of each proved to be a lot tougher than I would have anticipated. And that was the beauty of the exercise Christy had me do. Because moving the horse’s shoulders one stride from a standstill requires precision and deliberation in order to move just the shoulders, and nothing else. Tucker and I wove drunkenly around for a few minutes, until I got the feel for what I needed to do. And then we did a nice little cha-cha-cha. One step right, one step left. Then I switched my attention to the haunches. More drunken weaving ensued. And eventually, I got the feel for what was needed to move his haunches one step right, one step left. Tuck shook his cute chestnut booty. Maybe I should have titled this post “Horse Hokey Pokey,” … you put your left haunch in, you put your left haunch out. Wonder what the judges would think of that as a freestyle? Ha. Anyway, I digress. Once I was moving horse parts around with more specificity, Christy had me try these while walking, pointing out the important fact that I need to hone these specific aids, because they are what I’ll use to control shoulders that pop out or haunches that drift. These are tools I need to add to my kit. I aced the shoulder in, and got the shoulder out, too. I was on familiar ground. The haunches in and out were a different story all together. I did quite a bit of leg yielding instead of the desired movements. I took some deep breaths, and concentrated. I held my outside rein, I softened inside, I asked for a little bend inward, I slid my outside leg back a bit, to move the haunches out. “There! That’s it!” Christy exclaimed, towering over Tucker and me from her vantge point high up on Remy. I was beaming. This was fun, it was cool – but it’s hard! We experimented a little more and I had a few correct steps here and there. The lesson really wasn’t learning about how to ride the renvers and travers – I’m far away from that point. 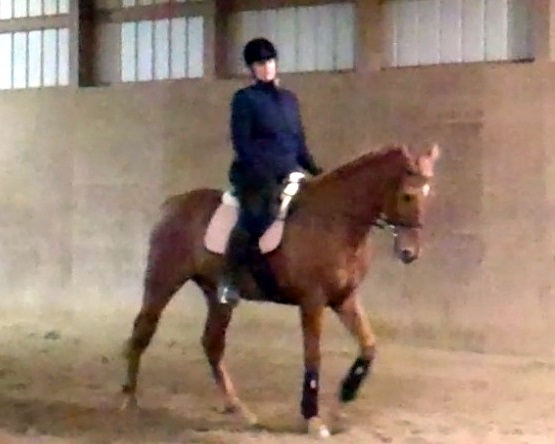 But it’s never too soon to learn how to more correctly influence the horse, and as Christy showed me with Remy, correct aids can generate the desired response – even from an uneducated mount.